Whether you ride on singletrack, open roads or city streets, Edge 130 is the perfect riding partner. Its compact, lightweight design features a 1.8” mono Memory in Pixel (MIP) display. That means you’ll get a completely crisp view of the screen, even in direct sunlight when you’d normally be squinting at your smartphone screen. You can even customize the display to show up to 8 data fields on each screen. And don’t let its slight stature fool you — Edge 130 is packed with additional features and gets up to 13 hours of battery life between charges. Wherever you ride, the Edge 130 bike computer captures your essential stats. With help from GPS, GLONASS and Galileo satellites plus a built-in barometer, it tracks how far, how fast and even how high you’ve ridden. 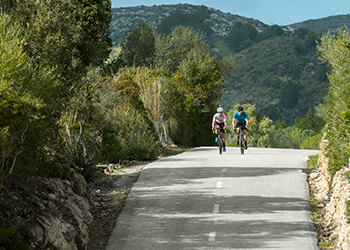 Plan and download your routes with the Course Creator feature from Garmin Connect. Edge 130 will guide you with easy-to-read course prompts and turn prompts. It’s even smart enough to direct you back to your starting location. A little peace of mind is going to make every ride that much better. That’s why Edge 130 is compatible with our Varia line of cycling awareness devices, including rearview radar and smart bike lights. By pairing these devices with your Edge bike computer, you can get alerts to approaching cars — right on your Edge display — and help drivers see you. Edge 130 also lets your friends and family follow your real-time location with the LiveTrack feature. And if you happen to run into difficulty during a ride, the Assistance feature, when using a compatible device, can quickly send your current location to chosen contacts so they know where to find you. The Edge 130 bike computer is designed to help you amp up your performance so you can strive to improve with every ride. It’s compatible with power meters, letting you see how many watts of power you’re producing on a flat section or a steep hill. Understanding where you are producing power helps not only with training, it also makes for a more epic ride. And you can make every ride a little more interesting by racing in real time against Garmin and Strava Live Segments, giving you that extra nudge to really push yourself. When using a compatible device, Edge 130 lets you keep your phone safely tucked away and still stay connected while you’re on the bike. Text messages will appear on your device screen so you can see them at a glance and keep right on riding. Know if you’re about to get rained out by using the weather page to keep tabs on current weather and forecasted conditions. 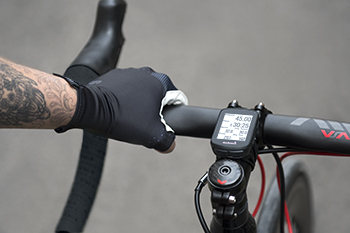 And remember — you can automatically upload your rides to the Garmin Connect online community, and even customize your device from our Connect IQ™ store by downloading configurable data fields such as the GU Fuel Reminder or Strava Suffer Score.